The only thing that would make this worse is if I'm related to these idiots, and trust me, it's possible. FORT WAYNE, Ind. 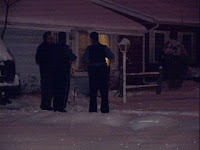 (WANE) - Fort Wayne police investigated a stabbing early Thursday morning and have determined that both the victim and her roommate had staged the story of being confronted by an intruder in their residence on White Oak Avenue. Detectives handling the investigation indicate that the wound to Tera Preston was administered by Matthew Menkes in hopes of Ms. Preston receiving prescription pain killers. Ms. Preston said she is disappointed that the Fort Wayne Police Department thinks that the stabbing was staged. She continues to stick with her story that a 6'5" black man broke into her apartment and stabbed her after she walked in on him. Detectives have yet to file charges in this incident and the investigation is ongoing. Check back at WANE.com for updates to this story as they become available.